Venice is not an easy city for disabled guests due to its structure. 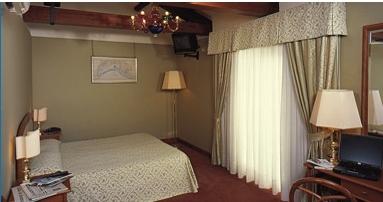 Hotel Residenza Parisi is attached to hotel Santa Chiara, which is located at Piazzale Roma, and can comfortably accommodate disabled guests in Venice. The hotel also has a private parking, which allows you to the hotel directly with your car. Hotel with 12 rooms, and comforts can 4 people and especially accommodate disabled guests, due to its standardized and equipped rooms. The hotel location itself close to all public services of Venice, buses and vaporetti, and the train station make it easier for our disabled guests to reach the place and manage to spend for spend a wonderful holiday in Venice.